Please show your support for the student occupation of St Andrews by sending them an email at standrewsoccupation@googlemail.com. They have also asked if support messages could be copied to Dr. Louise Richardson, the Principal, at principal@st-andrews.ac.uk. I spoke at their open meeting today on behalf of Tayside for Justice in Palestine and was impressed by their organisation (and very tempted to stay….). Their petition, signed by over 30 academics and 700 students, is pasted below. We, the concerned students of the University of St Andrews demand that the university condemns the illegal bombing and genocide in Gaza and Israel’s indiscriminate targeting of civilians. In particular, as an educational establishment we urge that it shows practical solidarity with the Islamic university of Gaza and other schools and colleges damaged during the bombing. Immediately suspends and pledges not to renew its contract with Eden Springs, the Israeli water company which illegally steals water from the Golan Heights. It is not enough that this contract run out this year, it must be cancelled now. Investigates its million pound research contracts with defense companies and the ministry of defense. Centrally, that the university sets up a review seeking to find replacement funding for the research contracts with BAe systems and its extensive links to Accenture. Both have close ties with the apartheid regime of Israel. Sets up a scholarship program for Palestinian Students and commits to a minimum of 10 scholarships. This would send out an important symbolic message that we will not turn a blind eye to the Palestinian students who are unable to study because of the attacks on educational infrastructure and constant state of terror which prevents students from attending university. Organizes a collection on campus, including a broadcasting of the DEC appeal, for aid for Gaza, makes available non-monetary aid such as course books, desks etc. and also establishes links with the Islamic University of Gaza in order to find out how it might aid with reconstruction. 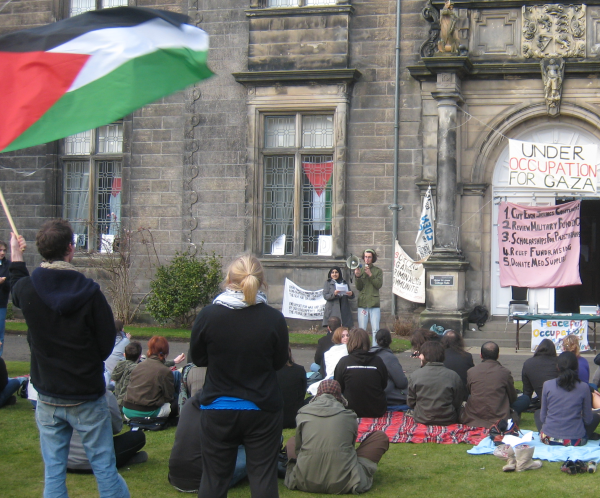 In all of these measure the university might link up with other Scottish and English universities who are also adopting similar policies in order to develop a common, humanitarian and equitable approach to Israeli companies and those linked to its war machine and to the Palestinian people and its ravaged educational infrastructure. This entry was posted in Events, Occupation and tagged Accenture, BAe, DEC, Gaza, St Andrews, University of St Andrews. Bookmark the permalink.